I have been told that this is literally the coldest day of my life. That means it may be a great day to get "Caged In," which is a term I've coined for remaining inside my house until I've exhausted all streamable Nicholas Cage movies. For those of you who had your classes canceled today, congratulations. I hope you celebrated last night cause it's probably never going to happen again. Ohio State falls to Michigan. Keandre Jones transferring to Maryland. The TBT will be back in Columbus. Needs and numbers for the 2020 class. Branden Bowen determined to earn a starting spot again. Word of the Day: Propitious. YURCICH'S OFFENSIVE EXPLOSIONS. Ohio State's passing game was quite literally the best its ever been last year, which makes brining in Mike Yurcich to help make things even better seem like a cheat code. The dude has quite the resume in a relatively short time in the coaching game. Yurcich’s career so far has been defined by taking an under-the-radar quarterback and turning him into a high-caliber player. He is responsible for four of Oklahoma State’s 10 best offensive seasons in school history. Over a six-year span, the Cowboys averaged 38 points and 478.3 yards per game. They scored at least 40 points 35 times, 50 points 15 times and 60 points three times. In 2018, he took Taylor Cornelius — who arrived in Stillwater, Okla., as a walk-on — and turned him into one of the top 10 quarterbacks in the country statistically. Cornelius finished the 2018 season with 3,978 passing yards and 32 touchdowns. Everywhere he’s been, Yurcich has led an offense that has broken records. Now he’ll coach a level of quarterback talent he hasn’t previously experienced. When spring practice begins, former five-star recruit Justin Fields, a transfer from Georgia, will be the most talented quarterback Yurcich has ever coached. I knew next to nothing about Mike Yurcich when he was hired, but I've never once thought badly of Oklahoma State's passing attack or quarterback play. Their offense has been as high-powered as it gets, and I couldn't tell you the last time they've signed a top-100 prospect. If Yurcich can average 478 yards with the guys signing at Oklahoma State – no disrespect – I understandably have extremely high hopes for his ability to work with some of the most talented players in the country. LIDDELL UNDERRATED? I say this all the time, but knowing the talent coming in next year makes this hoops season so much easier to stomach. It's like staring at your bank account in absolute dismay, but knowing that direct deposit is going to hit on Friday. It ain't fun now, but you know things are probably going to be alright if you can live off of Chef Boyardee for a few more days. For Ohio State, it's not a direct deposit, it's just one hell of a recruiting class. The Buckeyes have a top-10 class with three top-50 players incoming, and the lowest-rated player of the trio might be one of the most underrated players in the class. E.J. Liddell is capable of putting up as a collegian, I think we could look back and feel that he was underrated when it comes to college impact. I see a future All-Big Ten player and perhaps a conference player of the year before his time in Columbus is through. I think all three of these players will be some of the best we've seen in Columbus in quite a while and I'm stoked to see how they mesh with the guys on the current roster. ANOTHER BIG NIGHT FOR SILK. Speaking of Buckeye basketball, is D'Angelo Russell the best player in basketball? Silk had himself another stellar game last night, dropping 30 points and dishing seven dimes. Our resident football knower Kyle Jones, who might actually be even more of an NBA knower, wrote about Russell's legit chance to be an All-Star, and I absolutely agree. It's still crazy to me that he ever came to Ohio State, because his existence doesn't mesh with the overall narrative of the late Thad Matta years. The guy was the most talented player to wear the Scarlet and Gray since future NBA Hall of Famer Evan Turner, and he played for a bad team tucked in some between even worse teams. But he's still all Buckeye. I was a bit concerned when he initially said he'd probably never come back to Ohio State with Thad Matta gone, but then he helped the Buckeyes land their highest-rated prospect since him. 15/1 YOU SAY? 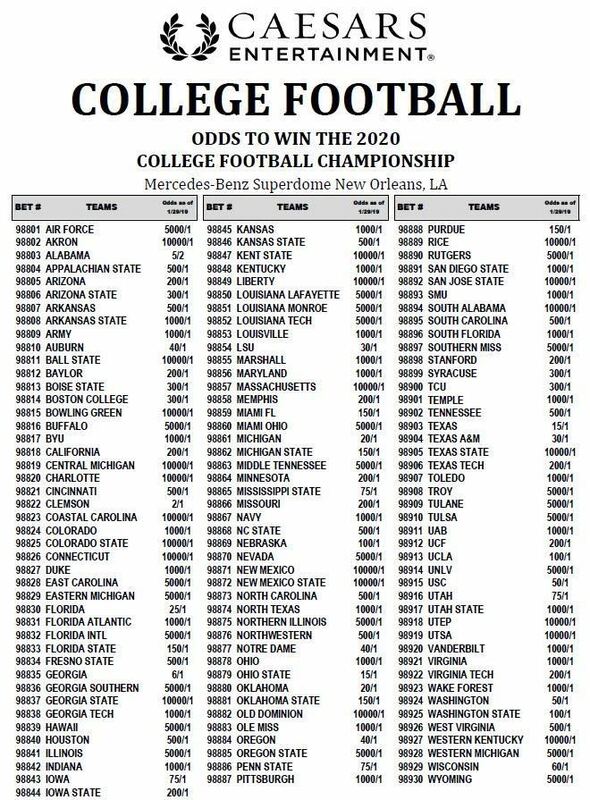 If you're into free money, Caesars casino has Ohio State at 15/1 odds to win the 2020 college football championship. For those of you who don't excel at math, that means a $100 bet would pay out $1,500 if the Buckeyes win. For reference, Ohio State has 8/1 odds on Bovada, which is obviously a substantially lower payout. I'm not out here guaranteeing the Buckeyes are going to win the national title, but 15/1 is a value bet, because I certainly like their chances of at least making the College Football Playoff. If that happens, you can hedge your way to a guaranteed profit, or ride it out and hope for a big payday. AL WASHINGTON SPECIAL. It's an extremely kind gesture by an Ann Arbor restaurant to name a dish after Ohio State's linebackers coach. I would like to make a motion that a local Columbus restaurant name a dish after Ohio State legends Rich Rodriguez, Brady Hoke and Jim Harbaugh.